BOSTON--(BUSINESS WIRE)--Over three-quarters (78%) of Americans say it’s up to them, not the government, to make sure they have enough money to live in retirement, but 77% are counting on family support to help fund their retirement, according to new survey findings published today by Natixis Global Asset Management. Millennials are twice as likely as Boomers to think that a financial inheritance from their parents or grandparents and support from their children will be important to meeting their retirement needs; 62% of Millennials, compared to 31% of Boomers, expect to receive an inheritance to help fund their retirement. 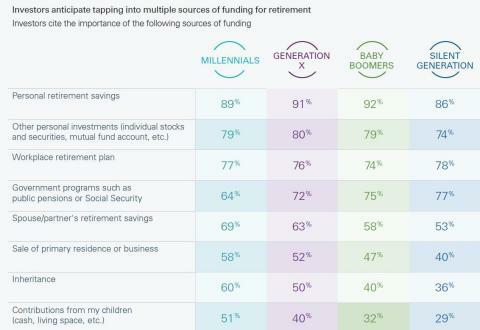 Furthermore, almost half (47%) of Millennials, compared to 24% of Boomers, say family assistance with finances and housing will be an important part of their financial security in retirement. Half of Americans (49%), including 60% of Millennials, and 43% of Boomers, will rely on cash from the sale of their homes and/or business in order to afford life in retirement. At least one-third of married couples – 33% of Millennials and 35% of Boomers – say their spouse’s retirement savings will be very important. Only about two in five (37%) expect Social Security to be a very important source of retirement income, including nearly half (47%) of Baby Boomers and 35% of Millennials. In fact, 41% of Millennials don’t expect Social Security benefits will even be available by the time they retire. Almost all Americans (98%) agree their personal savings and investments, including workplace retirement savings and other qualified retirement plans to be a very important source of the money they’ll need in retirement. Millennial’s reliance on a financial inheritance may leave many short-changed in the end. Nearly seven in 10 (68%) Millennials say they expect to receive an inheritance, yet four in 10 (40%) Boomers don’t plan to leave one. More than half of Boomers (57%) think they won’t have anything left, and another 35% plan to spend whatever money that’s left on themselves. In fact, Americans were the least likely among the 22 countries and regions surveyed to say they expected to leave an inheritance. In contrast, Mexicans were the most optimistic with 91% expecting to leave an inheritance, but only 37% expect to receive one. However, Americans were the second most generous in the global survey, with 53% saying they expect to donate a portion of their estate to charity, trailing only South Korea (54%). That compared to a global average of 37% of respondents. According to Natixis’ survey, Millennials expect to retire young. They say they plan to quit working at age 59, on average, a full six years earlier than Baby Boomers, who expect to retire at age 65. Millennials are saving at a rate based on their expectation to live for 25 years in retirement, which puts them at age 84 at the end of their financial plans. Yet one out of every four 65-year-olds today will live past age 90 and one out of 10 will live past age 95, according to data compiled by the Social Security Administration.1 The survey also found the cost of long-term care and out-of-pocket healthcare expenses are considered the biggest threats to financial security in retirement by both Baby Boomers and Millennials. Few investors are concerned about inflation. For example, only 17% of Millennials say they have factored inflation into their retirement savings planning. A 3% annual inflation rate2 could mean that a $100 purchase today would cost $181 by the time Millennials retire, which could severely accelerate the pace with which they burn through accumulated savings. Yet, nearly three in 10 (28%) Boomers don’t fully understand the Required Minimum Distribution (RMD) requirements, Natixis found. Even one-quarter (25%) of Boomers who have a financial advisor say their advisor has never talked with them about RMDs, and four in 10 (39%) have not explored proactive ways to manage the tax impact of their withdrawals. Millennials, in general, have taken a more proactive and pragmatic approach to planning and saving for retirement than older generations have. Even at their young age, 59% of Millennials already have established a financial plan to help reach their retirement savings goals, on par with 56% of Baby Boomers who have done the same. Seventy-one percent of Millennials say they have a general figure in mind for how much money they need saved by the time they retire, and more than half (54%) have a clear idea of how much they need to save each year to meet that goal. Moreover, 78% of Millennials are getting professional advice compared to only 55% of Baby Boomers. “Much of the retirement planning dialogue is focused on saving for retirement and that message is getting through to the younger generation, but too little attention and advice is given to planning for life in retirement,” added Farrington. Natixis found that three in 10 (29%) retirees still don’t know how much income they need annually to live on, let alone meet other goals. Forty-six percent of Baby Boomers say they want to leave a portion of their remaining assets to charity, yet only 6% feel they need professional advice on how to do it. Nearly two-thirds (64%) of Baby Boomers agree that they need financial advice even in retirement. At least one-third say they need professional advice to help with tax planning (33%), estate planning (33%) and understanding financial risks (37%). Nearly as many (27%) say they need help planning for financial implications of long-term care. Natixis surveyed 750 individual investors across the United States with a minimum of $100,000 in investable assets. The group included 223 members of Generation Y, also known as Millennials (age 21 to 36); 251 from Generation X (age 37 to 52) and 236 Baby Boomers (age 53 to 72), as well as 85 retirees. The online survey was conducted in February 2017 and is part of a larger global study of 8,300 investors in 22 countries and regions from Asia, Europe, the Americas and the Middle East. Visit durableportfolios.com/Individual-Investor-Retirement-Survey-2017 for more information. Headquartered in Paris and Boston, Natixis Global Asset Management, S.A. is part of Natixis. Listed on the Paris Stock Exchange, Natixis is a subsidiary of BPCE, the second-largest banking group in France. Natixis Global Asset Management, S.A.’s affiliated investment management firms and distribution and service groups include Active Index Advisors®;3 AEW Capital Management; AEW Europe; AlphaSimplex Group; Axeltis; Darius Capital Partners; DNCA Investments;4 Dorval Asset Management;5 Emerise;6 Gateway Investment Advisers; H2O Asset Management;5 Harris Associates; Loomis, Sayles & Company; Managed Portfolio Advisors®;3 McDonnell Investment Management; Mirova;7 Natixis Asset Management; Ossiam; Seeyond;7 Vaughan Nelson Investment Management; Vega Investment Managers; and Natixis Global Asset Management Private Equity, which includes Seventure Partners, Naxicap Partners, Alliance Entreprendre, Euro Private Equity, Caspian Private Equity and Eagle Asia Partners. Not all offerings available in all jurisdictions. For additional information, please visit the company’s website at ngam.natixis.com | LinkedIn: linkedin.com/company/natixis-global-asset-management. 7 Operated in the U.S. through Natixis Asset Management U.S., LLC.